A very full today of visiting some of the most impressive structures I have seem that date from 2nd century to the 12th century today. Unfortunately I also ended up with a slight cut on my right foot from having to take off my runners at almost every stop as these are religious locations. 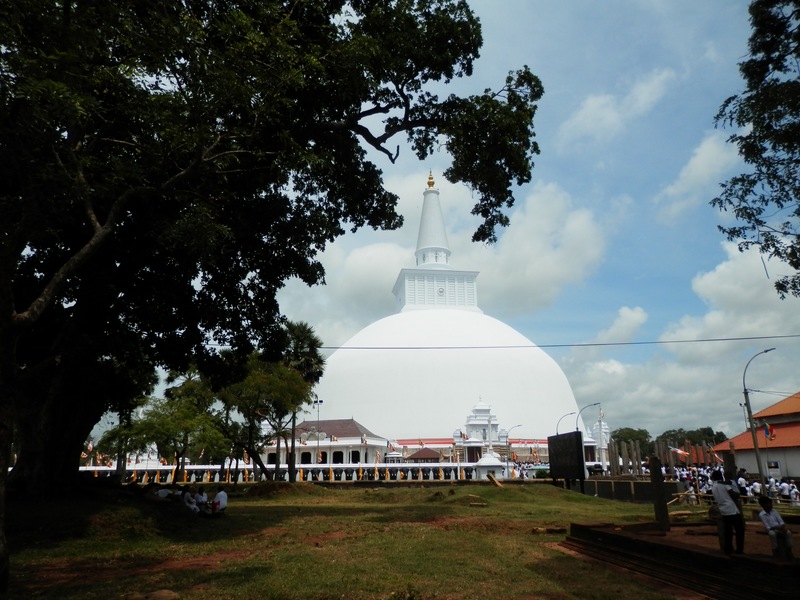 The Anauradhapura Stupas are the highlight the area having been in active use until the 13th century and semi-active use for a little while afterwards. 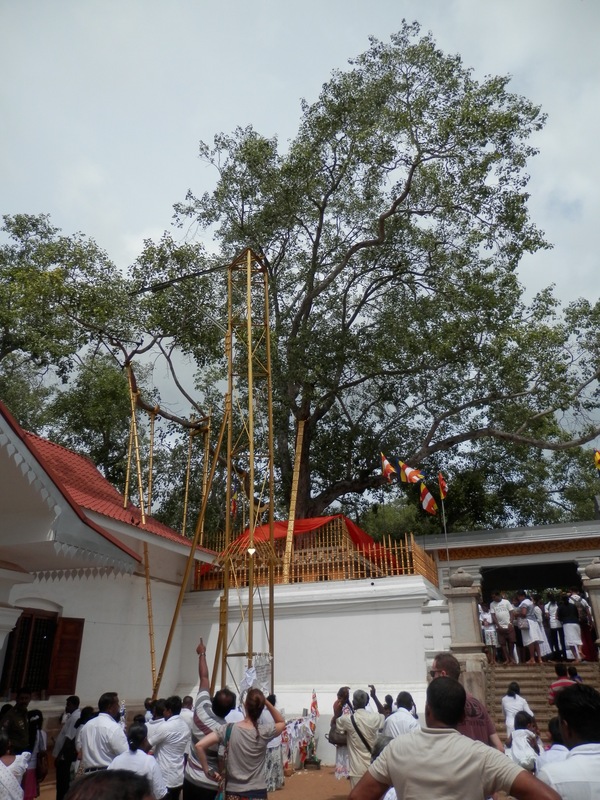 This is the Mecca of Buddhism in Sri Lanka the reason being this is the location that a sapling from the tree that the last Buddha sat under when he become enlighten is in this area. Buddhists all over Sri Lanka come to this place to mediate and made offerings under the alms approach. On this Saturday there were a large number of locals attending to provides gift to the monks, the numbers apparently were greater due to upcoming year 12 exams with families and students wanting to ensure they are spiritually centred. I watched this overcrowd area as more and more local communities come up with music (usually drums) playing as they marched to the centre. It definitely felt like something positive, great and even spiritual was happening. While I saw the remaining two Stupas, Ruwanweli and Lankarama I did not walk up to or around them. The most magnificent of these Stupas and the one near the enlightenment tree is the Mirisawatiya, a huge white Stupa with a gem at the top that is next to impossible to see the top of when standing near. The other stand out is the Petavanarama which is made entirely of bricks and which I first glanced during an earlier museum visit. This Stupa was totally covered in trees and grass when it was re-discovered in the 1930s and has slowly be restored. Another highlight of the Anauradhapura religious area was the Moon Stone and the Guard Stone both symbolising Buddhist principles. The Moon Gate in particular reflex the undying flame of greed in humans and the need to control this flame to be trually happy. I should also mentioned that there were monkeys everywhere in the Anauradhapura who seem right at home with no one bothering them other than the occasional Western tourist taking photos. Unfortunately as a religious site that meant the shoes had to go which proved problematic when climbing the last rock steps to both the Stupa and the Rock lockout (which was even a little dangerous at times). One result was getting s small cut on my left foot despite still wearing socks, so I left a little blood as my parting gift. Still I ended up with splendid view of the surrounding countryside. The monkeys playing and jumping into a small pool also made me laugh. 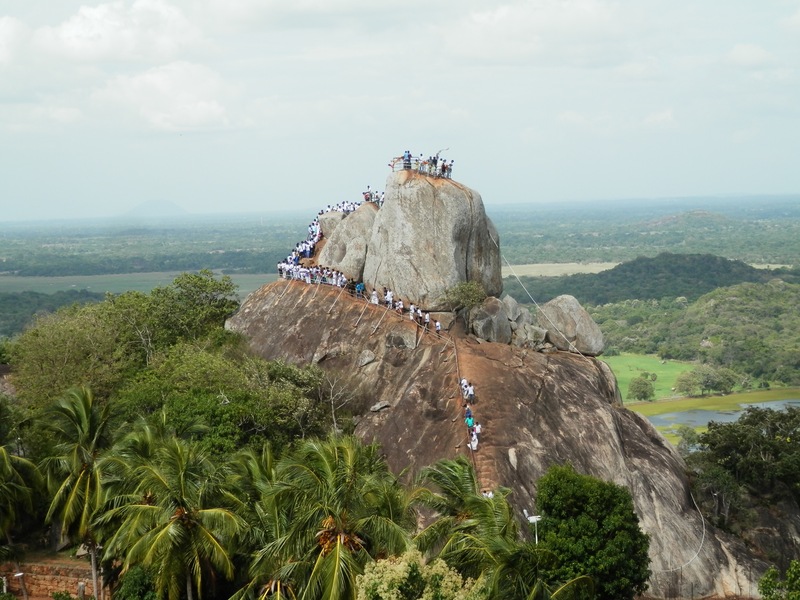 Mihintale Rock Lookup – More dangerous to clim then it looks! Before I knew it was I saying goodbye to my guide Jehan for the night back at the Palm Garden Village and settled in for a quiet dinner. Tomorrow I join the On The Go – Best of Sri Lanka & Test Cricket Tour. This entry was posted in Travel, World Trip 2016 and tagged OTG-Best-Of-Sri-Lanka, Sri Lanka. Bookmark the permalink.